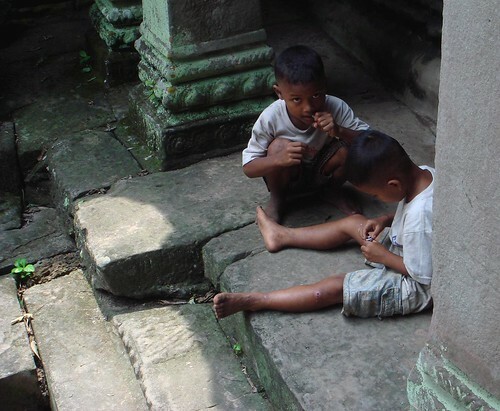 The kids I saw out and about in Cambodia seemed to be very independent. Very young children play all day without any adult supervision. Some kids were working hard to contribute to their family economy by selling souvenirs to tourists, hearding animals or by collecting fish, frogs and wild plants to eat. It was amazing to see tiny children riding grown up-sized bicycles along country roads. They only reach the pedals one at a time: they slowly wobble along with bare feet dangling until the next pedal comes back up. 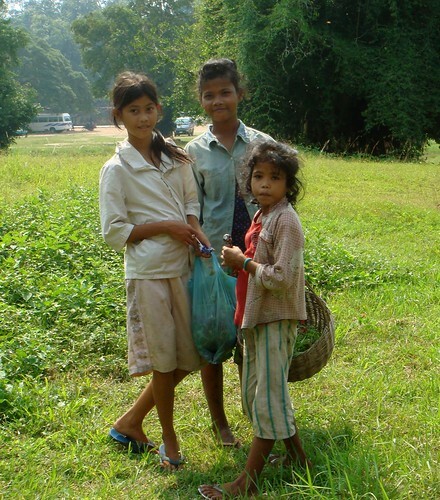 These three young ladies were collecting wild herbs around Prasat Sour Prat. 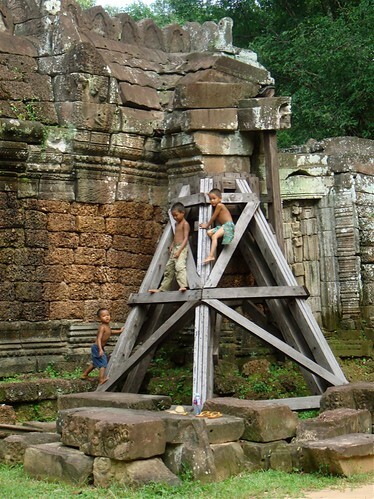 Little boys call Ta Som's shoring their playground. 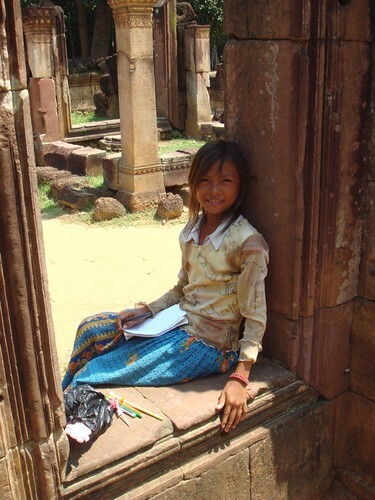 This terrific business woman sells guidebooks outside Banteay Kdei. I bought one from her because her sales pitch was irresistible even though kids were selling the same books for less! Her English was excellent. I asked her if she went to school and she replied that she does. 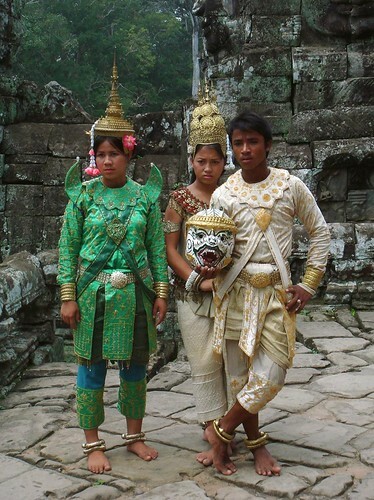 She's wearing a traditional Khmer krama scarf around her neck here. Next to our hotel in Siem Reap, we could not help but notice the Jayavarman VII Children's Hospital. Great crowds of people were waiting outside in the heat every day in search of hospital treatment for their sick kids. There was a large billboard in English advising of the ongoing epidemic of hemorrhagic Dengue fever and the need for blood donations. There was no way I could ignore that plea so I made a visit to the very sanitary Swiss-run Kantha Bopha Blood Bank inside. In Canada, I've had trouble giving blood due to my low blood pressure and small veins. Now I'm banned for life from donating here because I spent a year in the UK and I'm apparently a risk for spreading mad cow disease! In Cambodia, however, I bled freely and easily. It was, as they say, quick and painless. I really, really wanted to take a photo of the male nurse holding aloft the bag of my blood with Khmer script medical labels on it but I decided that a children's hospital wasn't the place for touristy snapshots. I asked the nurse how many donations the clinic receives. He said that the average is 15 to 20 foreign bleeders per day but the hospital has need for about 200 blood units a day. Apparently, Cambodians don't donate their blood. According to a shopgirl I chatted with, there's some kind of stigma or superstition attached to the practice. Still, considering the tens of thousands of tourists who pass right by the blood clinic daily, there really shouldn't be such a shortage. If you make the trek to Siem Reap, be sure to donate your blood, perhaps on your last day after you're finished with exploring the temples. It doesn't matter at all if you're taking anti-malarials or antibiotics or any other travelers' medicines. I hear that the Angkor Hospital for Children also in Siem Reap is in even greater need of donations (it is not a foreign NGO). I feel so happy to know that I left a useful little part of myself in Cambodia. Brave, sure. I would not let anyone stick a needle in me if it was not necessary... Hope you actually watched 'them' peel the needle out of it's plastic cover.